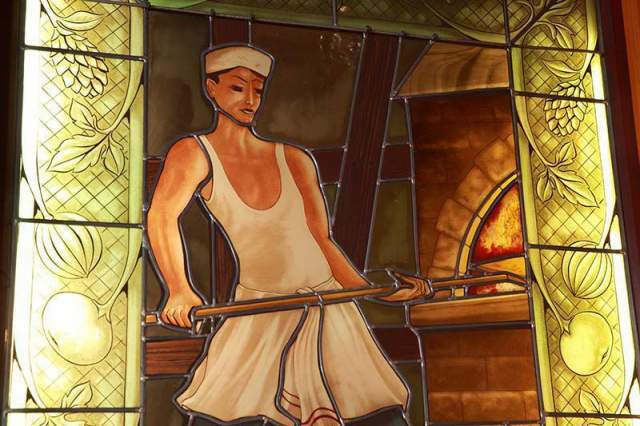 In Entzheim, the Steinkeller restaurant invites you on a culinary journey into the traditions of Alsace. 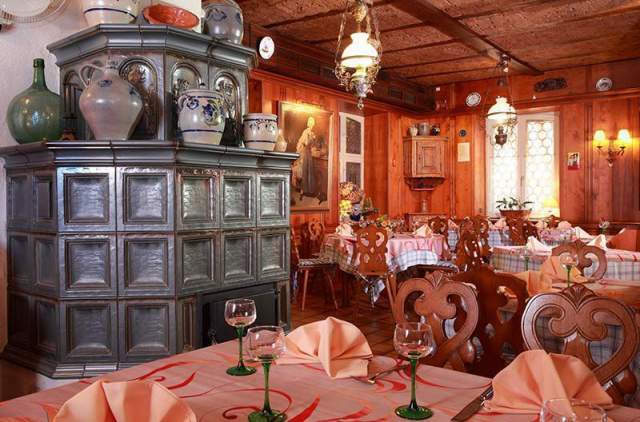 Sample local specialities and tartes flambées in a restaurant with an authentic ambience, a charming Alsatian farmhouse which has preserved all its ancient charms. 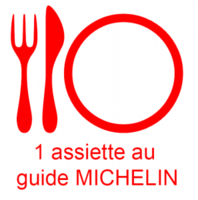 The restaurant was awarded an Assiette Michelin in the Michelin Guide. It also obtained the title of Maître Restaurateur. To book your table, please contact us by calling + 33 3 88 68 91 65. Le Caveau is open in the evenings only. At lunchtimes, meals are served in the other dining rooms. The other dining rooms are open every day except Saturday lunchtime, Sunday all day and Monday lunchtime. 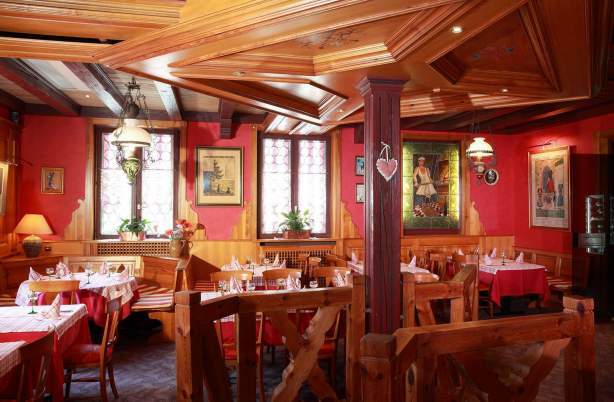 The restaurant has four dining rooms with an Alsatian ambience. The first is located in an actual cellar, as its Alsatian name suggests: Steinkeller. Below the period vaulted ceilings and between the dressed stone walls, savour simple and delicious gourmet Alsatian cuisine prepared with local produce: sauerkraut, offal, sweetbread, tarte flambée, etc. 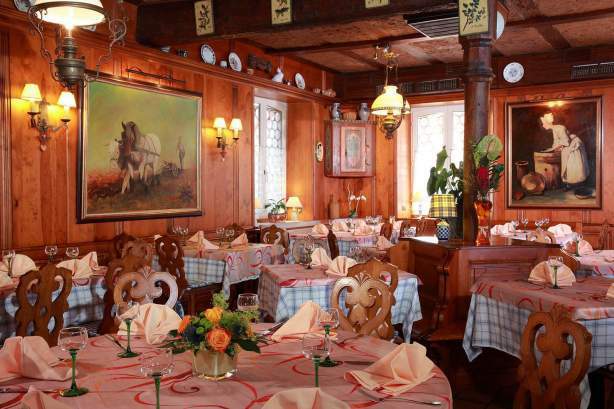 A traditional ambience and a warm atmosphere reign over the Steinkeller restaurant's Winstub. 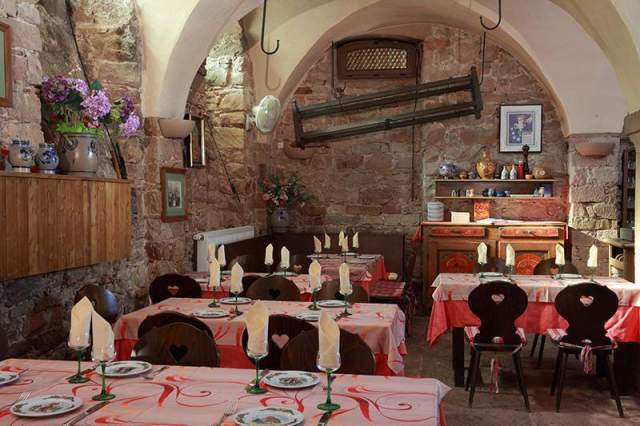 An authentic "Kachelofe" oven takes pride of place next to the dining room; pottery from Betschdorf or Soufflenheim, typical crockery from the region, wooden walls and furniture, everything there immerses you in the atmosphere of Alsace and its traditions. 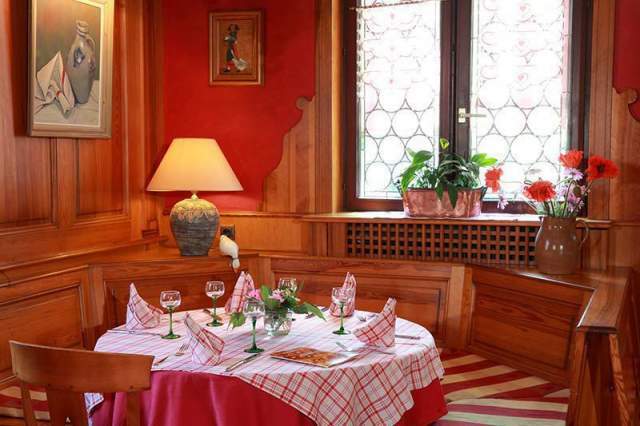 The Steinkeller restaurant's Alsatian specialities can also be enjoyed in Les 4 Saisons dining room. 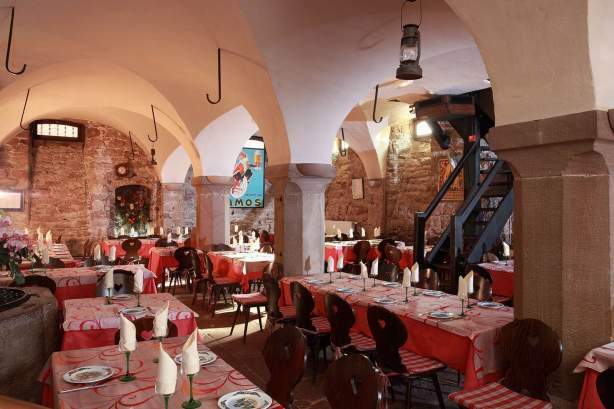 With its red-coloured walls, the ambience is cosy and the interior design pays due respect to regional tradition. Enjoy the fine weather on our veranda. With its well and its half-timbered facades decorated with a multitude of geraniums, the establishment's courtyard is laid out behind the large bay windows, an Alsatian décor which accompanies you throughout your stay. 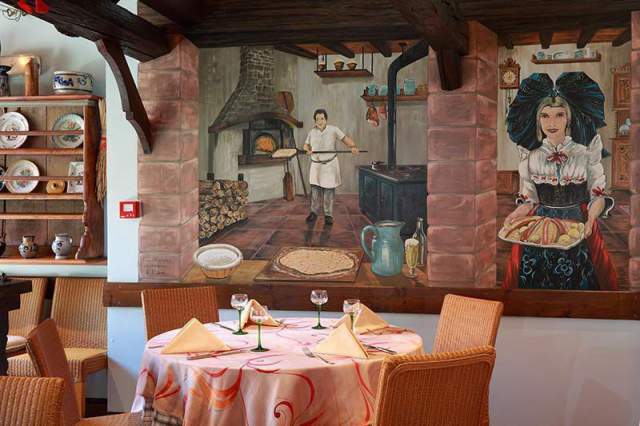 The dining room pays tribute to the region with its interior design: below the open beams, you will find a succession of local pottery, kougelhopf moulds and large frescoes depicting Père Benoît in front of his tarte flambée oven, or an Alsatian figure in traditional dress. 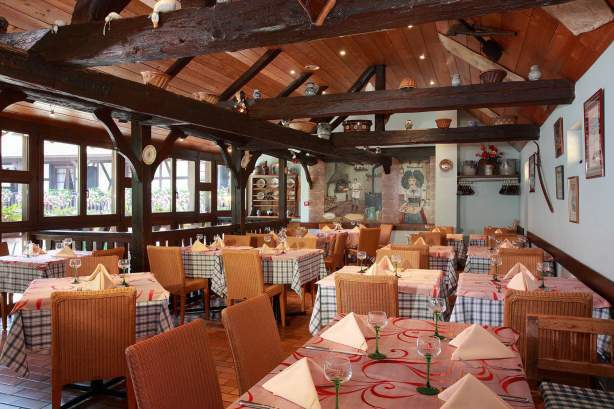 The Chef Denis Massé serves Alsatian specialities prepared with fresh local produce. Discover the gourmet tradition of Alsace and enjoy your meal with a local wine. In the evening, taste our tartes flambées, the quintessential convivial dish. Bouchée à la Reine (als. Suppepaschtetle) :The regional version of vol-au-vent. Cervelas : Small pork sausage (saveloy). Choucroute (als. Sürkrüt) :This form of pickled cabbage is finely sliced and fermented. « Choucroute garnie » is sauerkraut cooked in white wine with a selection of salted and smoked meats, pork meats and potatoes. Pork is the most commonly used meat. 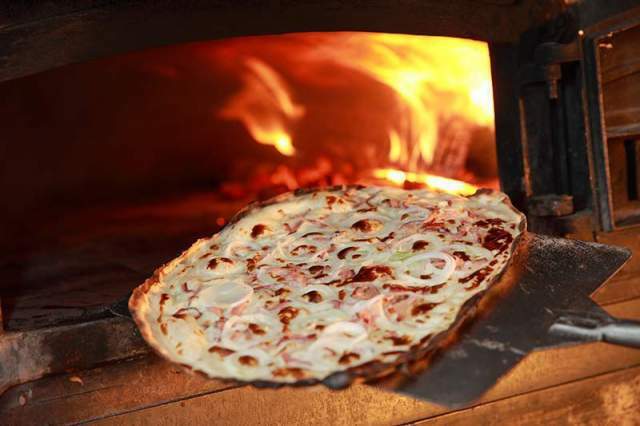 Flammekueche :A dish with a dough base topped with a mixture of cream, soft white cheese, bacon chunks and onions. You eat it with your fingers ! Presskopf :Pork brawn in jelly. Schifele :Smoked shoulder of ham. Spätzle :Traditional pasta that looks like shredded noodles. Wädele :Small knuckle of ham or shoulder of ham.